FRONTEO provides end-to-end project management, litigation consulting and eDiscovery solutions for a global base of law firms and corporations. To meet clients’ critical information needs, the business requires connectivity and data center solutions that can process, access and interpret terabytes of sensitive data—reliably and at top speeds. 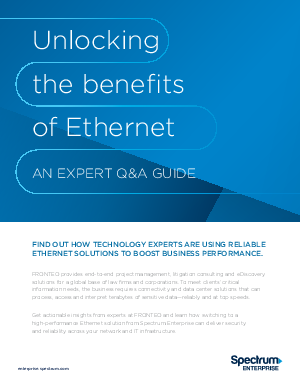 Get actionable insights from experts at FRONTEO and learn how switching to a high-performance Ethernet solution from Spectrum Enterprise can deliver security and reliability across your network and IT infrastructure.